Don't you think a beautiful wish from your favourite person makes your birthday even more special? 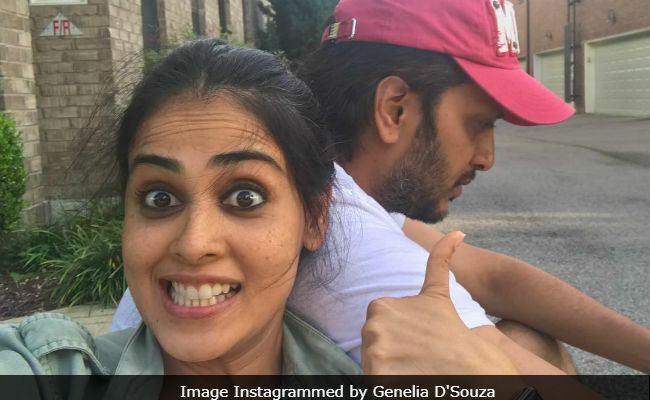 The reason we bring this up today is because Genelia D'Souza shared a beautiful birthday post for her actor-husband Riteish Deshmukh on her Instagram profile. Genelia summed up her relationship with Riteish in the sweetest way possible. She shared loved-up pictures along with a heartfelt note. In her birthday post, Genelia chronicled their (her and Riteish's) journey together and recalled how they celebrated Riteish's birthday together on the sets of the 2003 film Tujhe Meri Kasam, which was also the couple's first film together. She wrote: "I still remember celebrating your birthday on Tujhe Meri Kasam sets.. 17 years ago.. Time flies and I have had the opportunity to celebrate so many of your birthdays through all these years." Later in the post, Genelia expressed how Riteish's birthday will always be extremely "special" for her and she even thanked him for always standing by her. "Your birthday will always be most special to me because it's the day the world got its best creation and that creation is my partner through thick and thin.. I love you and I will take every opportunity to remind you of how much I do. Happy Birthday," wrote Genelia. Now that's called a birthday wish. Riteish and Genelia recently occupied a spot on the trends list after they shared screen space in the song Dhuvun Taak, from Riteish's film Mauli. Riteish shared the song with a special message for his wife Genelia and wrote: "Working with Genelia D'Souza after 4 years. First film to now - her magic on screen remains the same." New Song Out : #DhuvunTaak - Working with Baiko @geneliad after 4 years. First film to now - her magic on screen remains the same. @ajayatulofficial cha Dhin-Gaana Choreographed by @caesar2373 " Out Now! Full Song Link In The Story & Bio ..! Genelia D'Souza and Riteish Deshmukh first met on the sets of the 2003 film Tujhe Meri Kasam. After dating for over eight years, the couple got married in 2012 and they are parents to sons - Riaan and Rahyl. Genelia and Riteish have co-starred in Bollywood films such as Masti and Tere Naal Love Ho Gaya. They also worked together in the 2014 Marathi blockbuster Lai Bhaari. Meanwhile, here's how other Bollywood celebs wished the Mauli actor on his birthday. Anil Kapoor, in his post, described Riteish as an "entertainment powerhouse" and wrote: "Wishing the entertainment powerhouse Riteish a very Happy Birthday! I've always loved your work and I can't wait to see more of it!" Preity Zinta also shared an epic throwback picture on her Instagram profile. Burning the dance floor with the permission of the Shahenshah, @amitabhbachchan & happiest birthday to the guy who brings life to any occasion! @riteishd , have a great one ! #ThrowbackPicture #DanceTheNightAway #FunTimes #Ting ! Riteish Deshmukh was last seen in the Marathi film Mauli. He has Total Dhamaal, Housefull 4 and Marjaavaan in the pipeline.